This luxurious Sugar Scrub in a jar is a super easy "two-ingredient recipe" that you can make as a quick summer gift for a friend or neighbor! After making the scrub and decorating the jar, it’s a perfect fit in the slip-wrapped Kraft Gift Box – simple and so sweet! (I love the white flower on the belly band! So pretty!!) Then make the coordinating card to go with it all to complete your pretty gift ensemble! 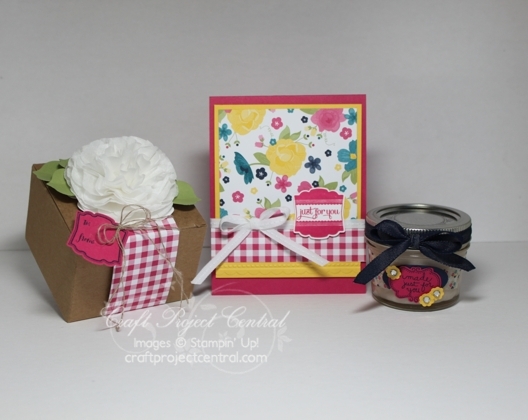 This pretty gift set project was designed by Julie! If you have a chance head on over to Julie's blog and leave her a comment on her project!